Designed for use with eBay Store use only. All formulas are updated to the most current eBay Fee Structure. Automatically calculates ALL of the fees associated with EBAY STORES (Along with Paypal and BidPay). Just specify the information about the bid and it will CALCULATE ALL FEES INSTANTLY. Track you eBay Store expenses with up to date calculation of the store fees. Fully interactive Inventory sheet. This sheet is a new addition and allows for the sorting of your inventory in 17 different ways. 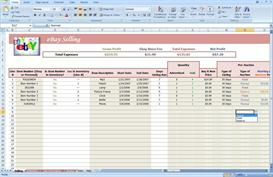 Your selling sheet will be able to tell you if the item is in inventory and where is it located. Customize this sheet in many ways to fit your business needs. USE THIS INVENTORY SHEET FOR OTHER NON-EBAY RELATED BUSINESS AS WELL. 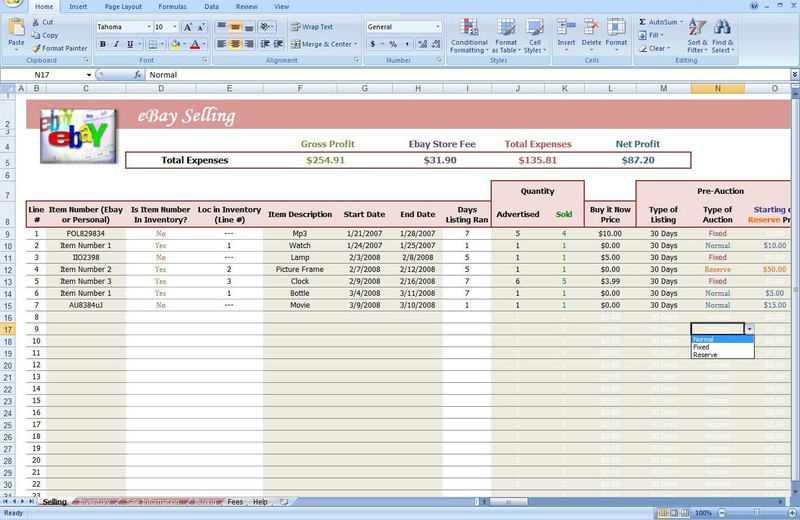 This spreadsheet is sold separately through my website at a discount if all you want is an inventory spreadsheet for business purposes (CLICK HERE). eBay Fee updater sheet is included. If eBay ever changes a fee, you can just change the fee on your spreadsheet with the touch of a button. "Conditional Formatting" applied so that the hundreds of 0s in number formatted boxes don't clog your brain. View a blank clean spreadsheet until you start typing in a line. 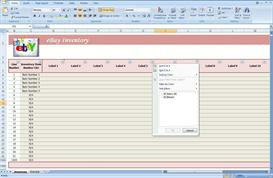 The spreadsheet is error protected so deleting formulas by accident and typing unusable data is difficult. Many boxes are drop-down style, so typing is not needed (but optional). Password to all code is granted upon purchase. Edit the spreadsheet any way you like. 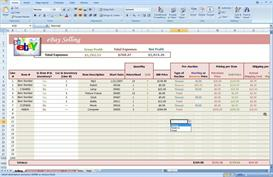 Keep track of up to 1000 items per Excel Spreadsheet. Want more? Simply copy and paste the workbook and use it again. Easy to read layout with a separate help files and example. Easy on the eyes and color coded so that you don't get mixed up. Payment can be made via Credit Card, PayPal, Online Check, Personal Check, or Money Order. Contact me first if you would like to purchase with a Personal Check or Money Order. My Website: If you purchase the spreadsheet through my website, "Buy this Spreadsheet" link above, you will be redirected to an instant download site where you can instantaly download the spreadsheet upon payment.